(1963) "You Don't Own Me"
(1963) "That's the Way Boys Are"
The song expresses a threatened emancipation, as the singer tells a lover that they do not own her, that they aren't to tell her what to do or what to say, and that they are not to put her on display. The song's lyrics became an inspiration for younger women and are sometimes cited as a factor in the second wave feminist movement. Gore said, "My take on the song was: I'm 17, what a wonderful thing, to stand up on a stage and shake your finger at people and sing you don't own me." In Gore's obituary, The New York Times referred to "You Don't Own Me" as "indelibly defiant". The song reached number two on the Billboard Hot 100 in the United States. The song remained at number two for three consecutive weeks on February 1, 1964, unable to overcome the Beatles' hit, "I Want to Hold Your Hand" and it became Gore's second most successful hit, next to "It's My Party". The song was Gore's last top-ten single. Dusty Springfield released this song on her 1964 album, A Girl Called Dusty. Joan Jett released a cover of the song on her debut album, originally titled Joan Jett, but re-released as Bad Reputation. The first release of her well known single I Love Rock 'n' Roll was a Europe only release double A side with You Don't Own Me released in 1979. Joan's version is fairly true to the original, the level of defiant independence remains in the vocals although with Joan's distinct vocal style. André Hazes recorded a Dutch-language version of the song in 1981 for his album Gewoon André; "Zeg Maar Niets Meer" was popular in Europe, and reached number 2 in the Dutch charts in early 1982. In 1998, Eva Pilarová sung a Czech version under the name "Cesta končí" on the album Requiem. (2014) "You Don't Own Me"
The song was covered by Australian singer and songwriter Grace and was released as her debut single. It features American rapper G-Eazy. Grace's version was produced by Quincy Jones, who also produced the original recording by Lesley Gore, and Parker Ighile. It was released on March 17, 2015 one month after Lesley Gore died, and peaked at number one on the ARIA Charts, later being certified 3× Platinum by the ARIA. The song was also a success in New Zealand, peaking at number five for two consecutive weeks, and in the United Kingdom, peaking at number four. In an interview with House of Fraser, Grace said "[Quincy Jones] told me how the song came out during the feminist movement and how it was such a strong statement. I loved the song, started researching Lesley Gore and fell in love with her as an artist. [You Don't Own Me] really inspired me." The song was released worldwide on March 17, 2015. It grew to prominence in the UK when it was used in the 2015 House of Fraser Christmas advert. It was also performed by The X Factor contestant Lauren Murray on November 28, 2015 and Matt Terry on October 8, 2016. The increased exposure for the song helped it rise to a peak of number four on the UK Singles Chart. The song was featured in the third trailer for the 2016 film Suicide Squad  and appeared on the film's soundtrack album. The song was featured in the opening of Riverdale's eighth episode in March 2017, as well as the background music for the 2018 Ford Mustang GT commercial, with Helen Hunt and Evan Rachel Wood. A music video directed by Taylor Cohen was released on June 1, 2015. ^ "Nirvana, Bowie, R.E.M. Songs Among Grammy Hall of Fame's 2017 Inductees". Rolling Stone. ^ Will Stos (2012). "Bouffants, Beehives, and Breaking Gender Norms: Rethinking 'Girl Group' Music of the 1950s and 1960s". Journal of Popular Music Studies. 24 (2): 117–154. doi:10.1111/j.1533-1598.2012.01322.x. ^ "Biography - Lesley Gore". Biography.com. Retrieved 2016-09-27. ^ "Lesley Gore, Teenage Voice of Heartbreak, Dies at 68". The New York Times. February 16, 2015. Retrieved September 27, 2016. ^ Richie Unterberger. 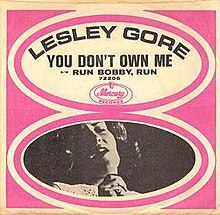 "You Don't Own Me - Lesley Gore | Song Info". AllMusic. Retrieved 2016-09-27. ^ "You Don't Own Me Song Facts". Songfacts.com. Retrieved 2016-09-27. ^ "Lesley Gore Chart History (Hot 100)". Billboard. Retrieved June 15, 2018. ^ "iTunes Store (AU) - Music - Grace - You Don't Own Me (feat. G-Eazy) - Single". iTunes Store (AU). 17 March 2015. Retrieved 15 April 2016. ^ a b "Grace - The Voice Behind our Christmas Avert". House of Fraser. Retrieved 16 April 2016. ^ "This is who covers Lesley Gore's You Don't Own Me in the Suicide Squad trailer". Metro. Retrieved 11 April 2016. ^ "Grace - You Don't Own Me ft. G-Eazy". YouTube. 1 June 2015. Retrieved 16 April 2016. ^ "Australian-charts.com – Grace feat. G-Eazy – You Don't Own Me". ARIA Top 50 Singles. Retrieved 23 May 2015. ^ "Austriancharts.at – Grace feat. G-Eazy – You Don't Own Me" (in German). Ö3 Austria Top 40. Retrieved 1 September 2016. ^ "Ultratop.be – Grace feat. G-Eazy – You Don't Own Me" (in Dutch). Ultratip. Retrieved 17 July 2015. ^ "Grace Chart History (Canadian Hot 100)". Billboard. Retrieved 8 September 2016. ^ "ČNS IFPI" (in Czech). Hitparáda – Digital Top 100 Oficiální. IFPI Czech Republic. Note: Change the chart to CZ – SINGLES DIGITAL – TOP 100 and insert 201634 into search. Retrieved 1 September 2016. ^ "Le Top de la semaine : Top Singles Téléchargés - SNEP (Week 32, 2016)" (in French). Syndicat National de l'Édition Phonographique. Retrieved 13 August 2016. ^ "Archívum – Slágerlisták – MAHASZ" (in Hungarian). Single (track) Top 40 lista. Magyar Hanglemezkiadók Szövetsége. Retrieved 3 September 2016. ^ "Chart Track: Week 2, 2016". Irish Singles Chart. Retrieved 16 January 2016. ^ "Classifica settimanale WK 34" (in Italian). Federazione Industria Musicale Italiana. Retrieved 27 August 2016. ^ "Charts.nz – Grace feat. G-Eazy – You Don't Own Me". Top 40 Singles. Retrieved 24 July 2015. ^ "Portuguesecharts.com – Grace feat. G-Eazy – You Don't Own Me". AFP Top 100 Singles. Retrieved September 1, 2016. ^ "Official Scottish Singles Sales Chart Top 100". Official Charts Company. Retrieved 5 December 2015. ^ "ČNS IFPI" (in Slovak). Hitparáda – Radio Top 100 Oficiálna. IFPI Czech Republic. Note: insert 201539 into search. ^ "ČNS IFPI" (in Slovak). Hitparáda – Singles Digital Top 100 Oficiálna. IFPI Czech Republic. Note: Select SINGLES DIGITAL - TOP 100 and insert 201633 into search. Retrieved 1 September 2016. ^ "Spanishcharts.com – Grace feat. G-Eazy – You Don't Own Me" Canciones Top 50. Retrieved 22 February 2016. ^ "Swisscharts.com – Grace feat. G-Eazy – You Don't Own Me". Swiss Singles Chart. Retrieved 29 February 2016. ^ "Official Singles Chart Top 100". Official Charts Company. Retrieved 18 December 2015. ^ "Grace Chart History (Hot 100)". Billboard. Retrieved 23 August 2016. ^ "Grace Chart History (Pop Songs)". Billboard. Retrieved 27 April 2016. ^ "ARIA Charts – Accreditations – 2019 Singles". Australian Recording Industry Association. Retrieved 30 March 2019. 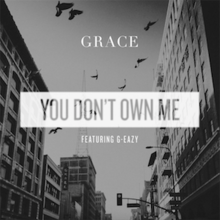 ^ "Canadian single certifications – Grace – You Don't Own Me (Feat. G-Eazy)". Music Canada. Retrieved 29 September 2016. ^ "Italian single certifications – Grace – You Don't Own Me (Feat. G-Eazy)" (in Italian). Federazione Industria Musicale Italiana. Retrieved 29 September 2016. Select "Tutti gli anni" in the "Anno" drop-down menu. Select "You Don't Own Me (Feat. G-Eazy)" in the "Filtra" field. Select "Singoli online" under "Sezione". ^ "New Zealand single certifications – Grace feat. G-Eazy – You Don't Own Me". Recorded Music NZ. Retrieved September 4, 2015. ^ "Polish single certifications – Grace feat. G-Eazy – You Don't Own Me" (in Polish). Polish Society of the Phonographic Industry. Retrieved 1 March 2017. ^ "British single certifications – Grace feat. G-Eazy – You Don't Own Me". British Phonographic Industry. Retrieved 30 September 2016. Select singles in the Format field. Select Platinum in the Certification field. Type You Don't Own Me in the "Search BPI Awards" field and then press Enter. ^ "American single certifications – Grace feat. G-Eazy – You Don't Own Me". Recording Industry Association of America. Retrieved 10 July 2016. If necessary, click Advanced, then click Format, then select Single, then click SEARCH. "I Love You Love Me Love"
This page was last edited on 18 April 2019, at 20:35 (UTC).